“This would be the easiest job in the world... if it weren’t for that tarp.” That’s what Pat Santarone — Baltimore Orioles head groundskeeper from 1969 to 1991 — used to say. Luckily, most of you will never have to wrestle with a 175 foot tarp that can weigh up to a ton! That is definitely a job suited for fields with plenty of man power. 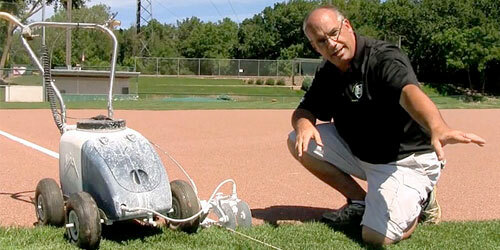 As a groundskeeper, rainfall can create some of your biggest challenges. Coaches, players, and league officials will lobby to get back on the field as soon as possible. Your job is to resurrect the fields after rains to bring them back to being safe and playable before allowing play on them. You’re faced with a balancing act. You need to work with the field and Mother Nature to get fields ready, while understanding people want to play as soon as they can. 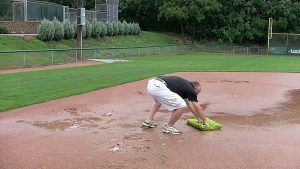 In this lesson we’ll show you how to get ballfields back to a playable condition, and some preventative measures that will help lesson the effects of rain.